After finally graduating from University I have made these little fellows for our graduation / farewell party and they were a great success. I have used a standard blueberry muffin recipe but used frozen blueberries instead of fresh ones, which made the cupcakes slightly too moisture, so be aware when you use frozen ones. Let them completely thaw and drain the emerged fluid before giving them into the cake mixture. For the icing I tried something different this time as I have mixed the icing sugar with a few table spoons of sour cream until I got a nice smooth and thick texture. This can be easily spread onto the cupcakes with a small spoon. 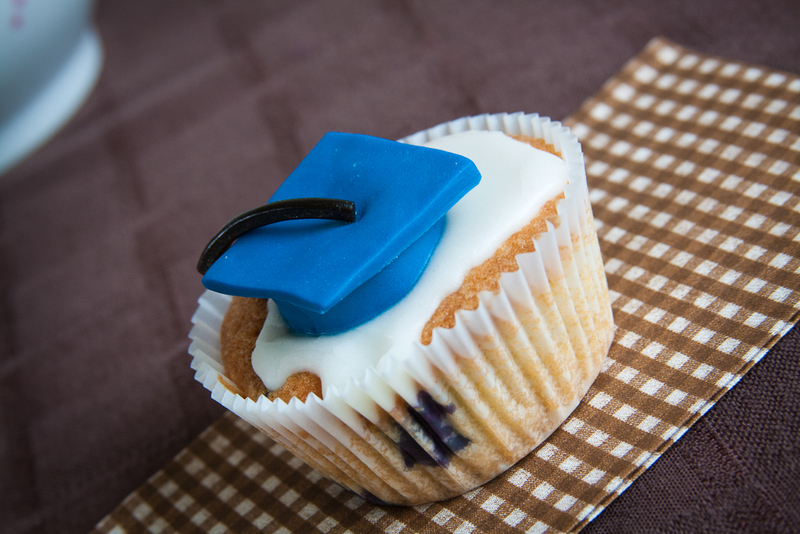 Just before the icing turned hard I added my little graduation hat which is made out of fondant and liquorice. 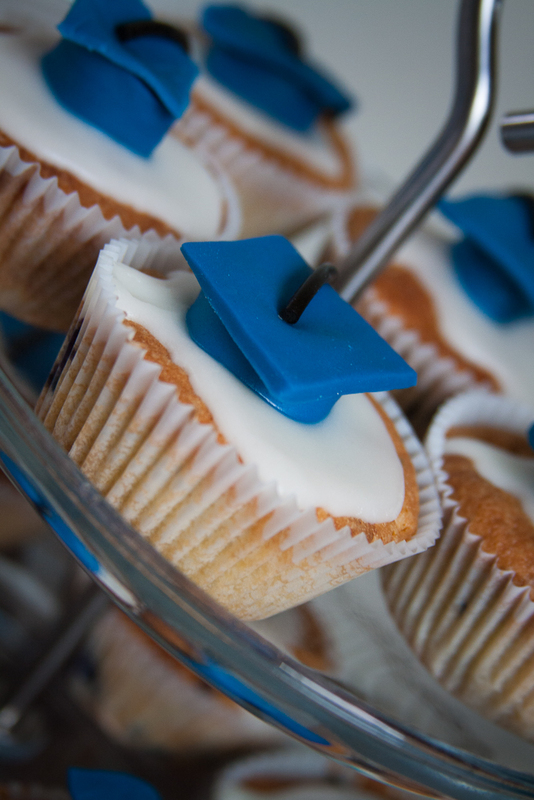 Roll out the ready-to-roll icing to a thickness of about 3 mm. Choose any color that you like and if you can not find a suitable color just color white fondant icing with some food coloring you like. Knead it thoroughly so that you get an even color throughout the icing. Always roll it out on a surface slightly dusted with icing sugar and best on a non sticky surface. Cut out long stripes of fondant and clue them together by using a bit of water making a small cylinder. But be aware not to use too much water, otherwise it will not sticky nicely together and you will get “stains” on your fondant. Just wet your fingers or a brush slightly and only apply to the area you need it to. Than cut out little squares which will just cover the small cylinder you have just made. Finally use a bit of water to wet the surface of the cylinder and apply the square on top to create a hat. Let it rest preferably over night, so that the fondant gets hard and stays glued together. For the cord I have used liquorice which you can get form of wheels. Just “unwheel” them and cut the stripes into the sized you need 😉 Apply on top of the hat again by making the fondant a little wet or use some icing which you can pipe on top of the hat.